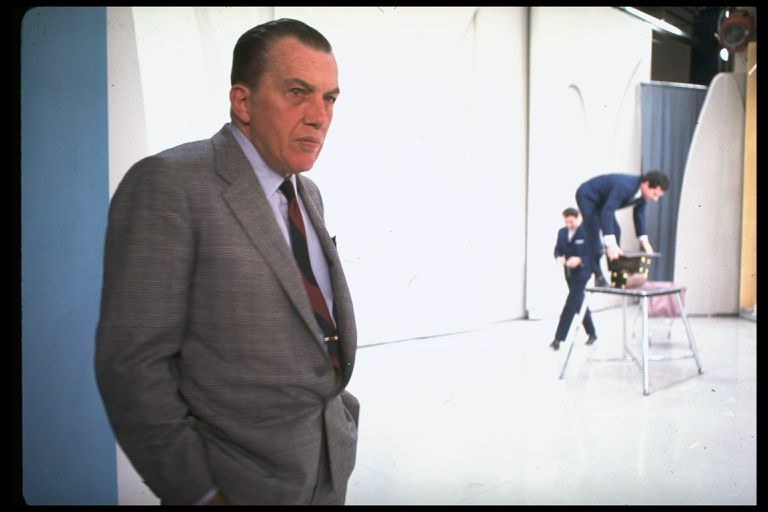 Ed Sullivan was a newspaperman who became an unlikely cultural force during the early decades of television. His Sunday night variety show was considered a weekly event in homes around the country. "The Ed Sullivan Show" is widely remembered for giving The Beatles their first exposure in America, an event in early 1964 which seemed to change the culture overnight. A decade earlier, Elvis Presley had also made a huge impression on Sullivan's stage, generating a national controversy while turning many young Americans into instant fans of rock 'n' roll. Known For: As host of a weekly variety show broadcast on Sunday nights, Sullivan had enormous influence on American show business. Besides showcasing musicians, Sullivan's weekly show was marked by its eclectic, and often simply odd, array of performers. Broadway stars might perform a scene from a hit musical, nightclub comedians would tell jokes about their wives and mothers in law, magicians would perform elaborate tricks, and circus performers would tumble, juggle, or spin plates. What happened on Sullivan's show became part of the national conversation. By the time his show ended in 1971, it was estimated that more than 10,000 performers had appeared. During the 1950s and 1960s a mark of success in show business meant appearing on "The Ed Sullivan Show." Edward Vincent Sullivan was born on September 28, 1902, in the Harlem neighborhood of New York City. His father, a customs inspector, was the son of an Irish immigrant, and his mother was an amateur painter who loved the arts. Sullivan had a twin brother who died in infancy, and as a child his family moved out of New York City to Port Chester, New York. Growing up, Sullivan was influenced by his parents' love of music. He attended Catholic schools, and at St. Mary’s High School he wrote for the school newspaper and played several sports. After high school an uncle offered to pay his college tuition, but Sullivan chose to go directly into the newspaper business. In 1918 he got a job at the local Port Chester newspaper. He briefly worked for a newspaper in Hartford, Connecticut, but then moved on to New York City. In the early 1930s he became a columnist for the New York Daily News. He covered Broadway and show business in general, and began appearing on radio broadcasts. Sullivan's show was not immediately successful, but after obtaining a new steady sponsor, Lincoln-Mercury automobiles, and a new name, "The Ed Sullivan Show," it caught on. His 1974 obituary in the New York Times noted that Sullivan's appeal was often baffling to anyone seeking to explain it. Even his onstage awkwardness became part of his charm. His weekly promise to the audience was that he was presenting a "really big show." For decades, impressionists, playing on Sullivan's peculiar diction, mimicked his catchphrase as "a rilly big shew." The core of Sullivan's lasting appeal was his credibility as a judge of talent. The American public came to believe that if Ed Sullivan put someone on his show they were worthy of attention. In the summer of 1956, Elvis Presley appeared on television on “The Steve Allen Show.” But it wasn’t until his appearance on Ed Sullivan’s program on September 9, 1956, that mainstream America was shocked by what they saw. (Sullivan, recuperating from a serious auto accident, didn’t host that night; actor Charles Laughton was the guest host.) Some viewers, appalled by Presley’s “suggestive” dancing, criticized Sullivan harshly. The television critic of the New York Times, Jack Gould, published a denunciation of Presley the following Sunday. Gould wrote that Presley was a “gyrating figure” generally found on the fringes of show business, and that his “bumps and grinds” could “overstimulate” teenagers. The following month, Elvis returned for a performance on the night of October 28, 1956. Sullivan was back hosting, and again criticism followed. Sullivan hosted Elvis again on January 6, 1957, but CBS executives insisted that the singer only be shown from the waist up, keeping his swiveling hips safely out of sight. Eight years later, Sullivan made more cultural history by hosting The Beatles on their first visit to America. Their initial appearance, on February 9, 1964, set ratings records. It was estimated that 60 percent of American televisions were tuned into their performance. Coming less than three months after the assassination of President Kennedy, Sullivan showcasing The Beatles seemed like a very welcome bit of fun. In the following years, Sullivan would host a number of musicians who were changing the culture, including The Rolling Stones, The Supremes, James Brown, Janis Joplin, The Doors, The Jefferson Airplane, Johnny Cash, and Ray Charles. When network affiliates and advertisers suggested he should avoid booking black performers so as not to offend viewers in the South, he refused. Sullivan’s show endured for 23 years, ending in 1971. He produced some TV specials after giving up the weekly show before becoming ill with cancer. He died in New York on October 13, 1974. "Ed Sullivan." Encyclopedia of World Biography, 2nd ed., vol. 19, Gale, 2004, pp. 374-376. Gale Virtual Reference Library. Coletta, Charles. "Sullivan, Ed (1902–1974)." St. James Encyclopedia of Popular Culture, edited by Thomas Riggs, 2nd ed., vol. 5, St. James Press, 2013, pp. 6-8. Gale Virtual Reference Library. Goldfarb, Sheldon. "The Ed Sullivan Show." Bowling, Beatniks, and Bell-Bottoms: Pop Culture of 20th-Century America, edited by Sara Pendergast and Tom Pendergast, vol. 3: 1940s-1950s, UXL, 2002, pp. 739-741. Gale Virtual Reference Library. Which Celebrities Have Hosted "Today"? Did your favorite talk show host go to your school? Find out now!